Utstillingstittelen Laterna Magica viser til forfatteren William Heinesens (1900-1991) novelle med samme navn. Denne teksten skildrer et barndomsminne; to guttungers kriblende forventning før en laterna magica framvisning. Imidlertid fungerte instrumentet ikke, og forestillingen ble avlyst. Til tross for dette, eller kanskje nettopp derfor, ble de mange timene i forkant med frydefull forventning og fabuleringer et høyt skattet minne for ham. Her er Heinesen inne på en av kunstens viktigste essenser – ansporingen av betrakterens tanke og fantasi. 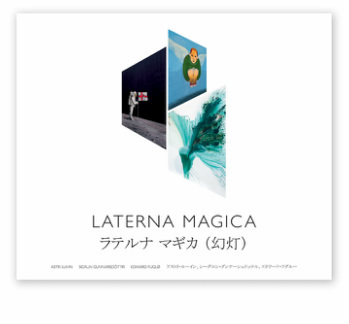 Laterna Magica, the exhibition’s title, is a reference to William Heinesen’s (1900-1991) short story of the same name. The story narrates a childhood memory: two boys impatiently await a magic lantern show. But while they wait, the machinery is found to be inoperative and the show is cancelled. In spite of this, or perhaps precisely because of it, the many hours spent in front of the stage, filled with joyful expectation and wild imaginings, are to the author a highly priced memory. Here, Heinesen treats one of the most important essentials of art – the prompting of the viewer’s ideas and imagination.